For frugal folks in the market for a new smartphone on Verizon, this news should please you: Big Red has lowered the off-contract price of the Motorola DROID MAXX by $50. 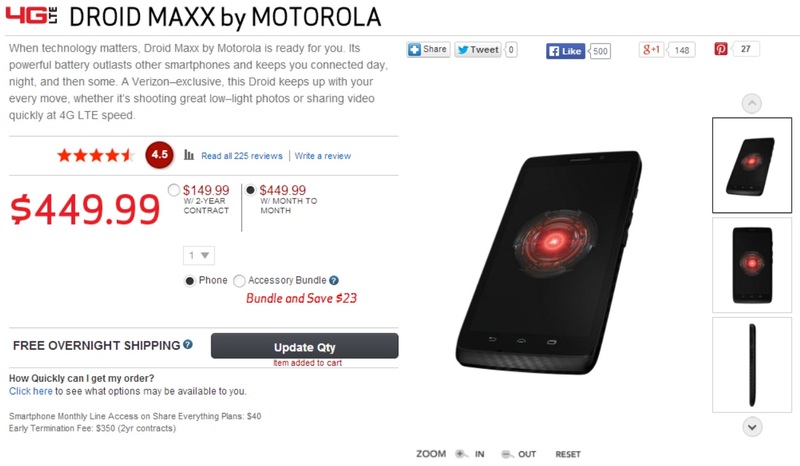 Once $499, the handset can now be had for a mere $449. That’s the going price for the Moto X, which is definitely uncoincidental, considering they pack an identical processor and camera. The Maxx, however, comes with a 3,500 mAh battery included, which translates to power for up to 48 hours. It also features a slightly larger screen (5-inch vs. the Moto X’s 4.7-inch) and a Kevlar unibody design. If those features appeal to you, consider following the link to pick one up. Should you need more info on the MAXX, be sure to check out our review. The on-contract price is now $149. Cut the Rope 2 Launches for iOS, Should Hit Android "Early Next Year"